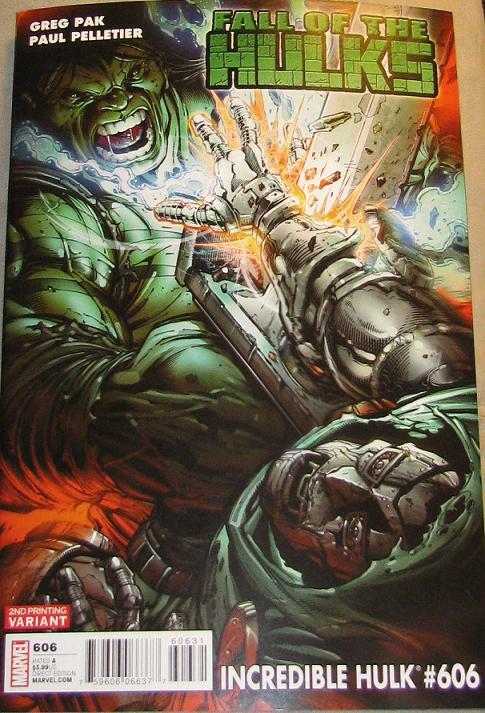 And last but not least – one of the most famous Hulk covers with a huge hand! Little Hulk all put together! Picked this little guy up on Wednesday. Basically it comes as just the head – and you open it up and there is a little body in there. 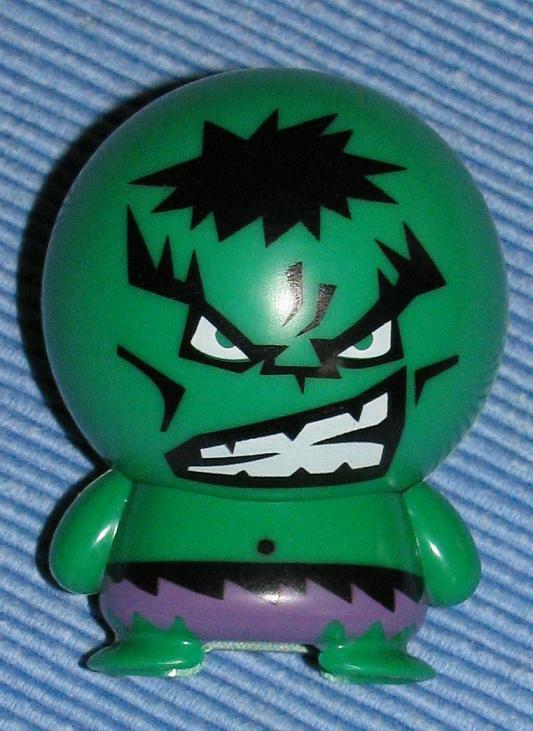 With the head being hollow it makes the figure really light – and easy to stand. 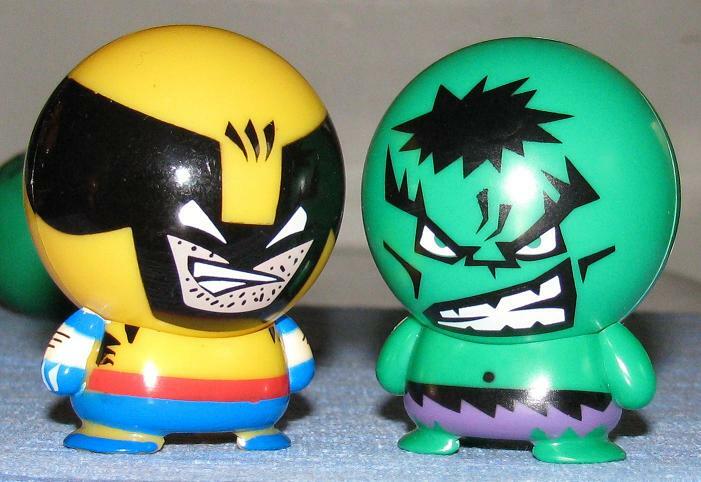 But it alos makes the figure feel pretty cheap… which it is so, then it fits I guess. 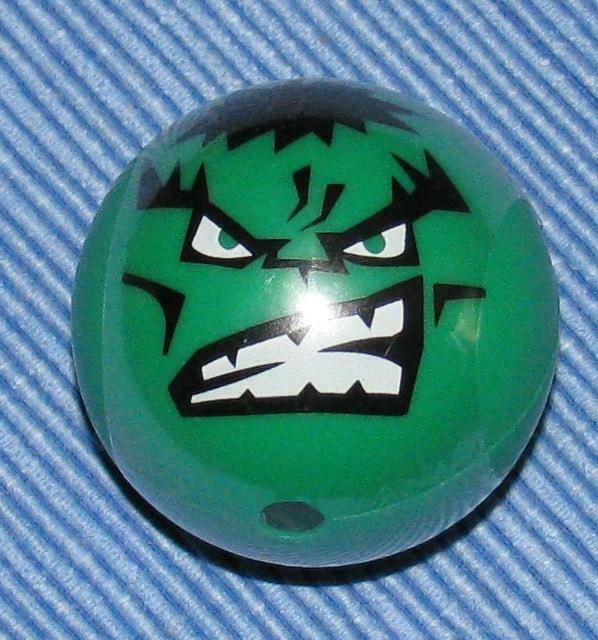 I picked up a few others of these – and I have no idea why because they are pretty ugly. 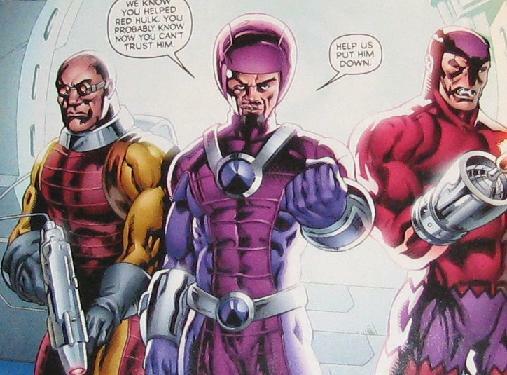 They are deformed, cheap, ugly and that’s the good points! 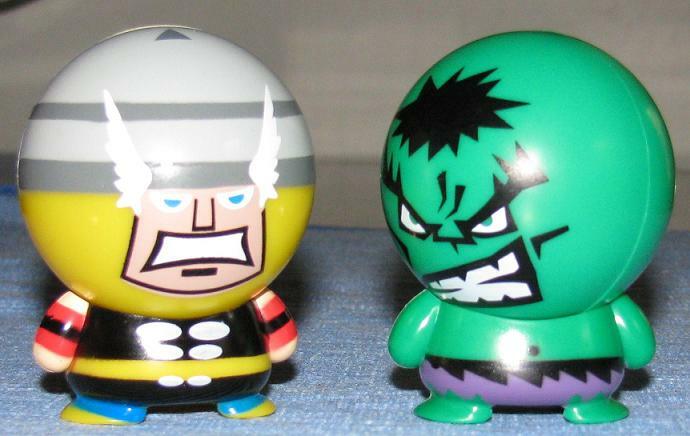 The worst of these little figures is the Thor figure – but I do have to say that the little bodies are kind of cool. These hands are so big all you see are the fingers! Holy crap! Hope you picked these up too~! 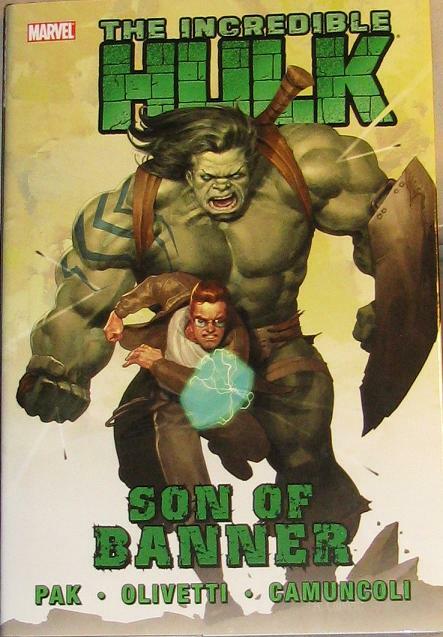 TIH #606 2nd print came out – which is sort of a big deal since it’s the first issue that went into 2nd print for a while – also the HC collecting TIH #601 – 606 + the List came out called: Son of Banner. We are now being filled in on a lot of the back story of the muddled mess Loeb handed us. I for one am so happy that Parker and Pak are here to “fill in the blanks” – and Parker’s issues are really, really good. Issue #2 deal with Thundra’s part in all of this. 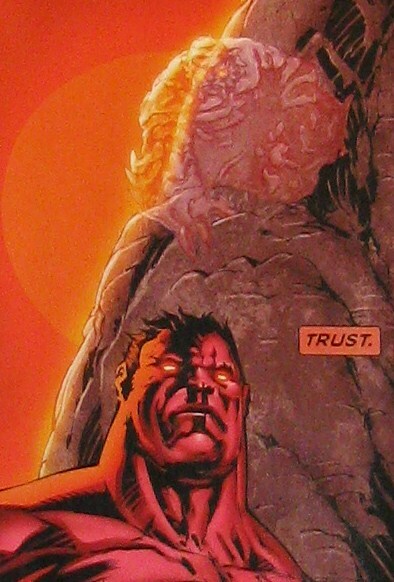 First, Banner if informed of who his daughter is – and how she came to be – all told to him by the Red Hulk. 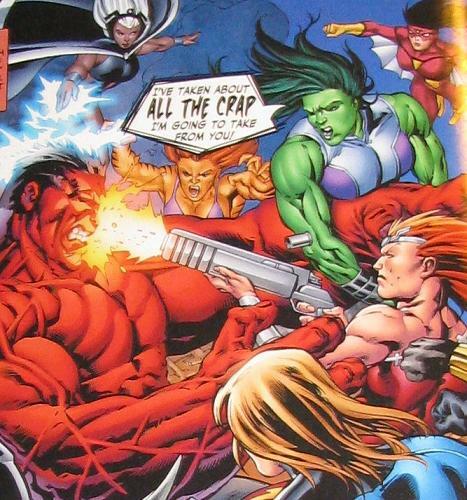 Next, we learn that the Red Hulk had always known that his then allies were going to turn on him – and he recruited Thundra to be on his team when the other shoe dropped. 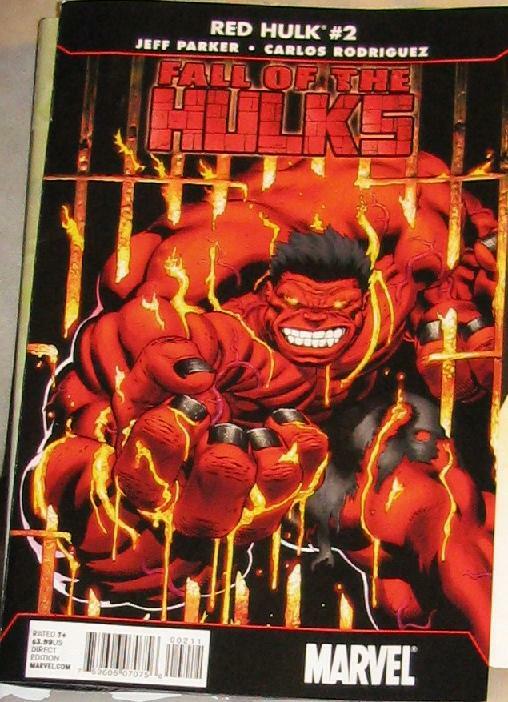 He tells her that they will promise to send her back to her time – but they aren’t the most trustworthy – and if she sticks with the Red Hulk instead of turning on them – that he will help her in any way he can to find a time machine. 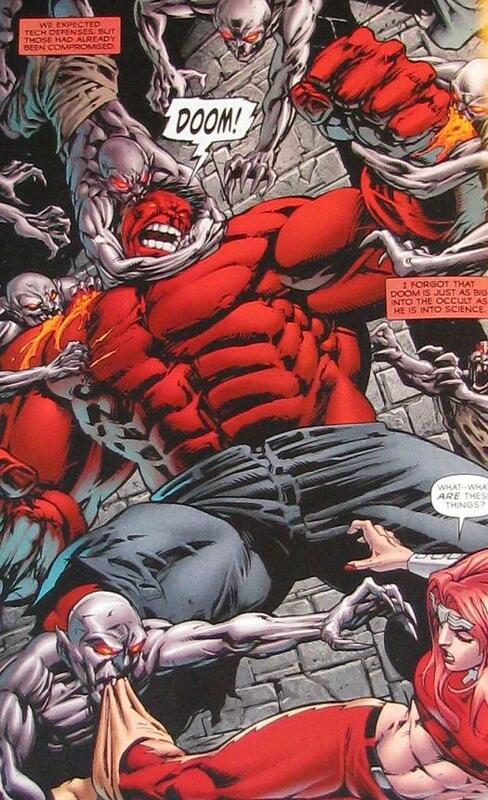 Red Hulk to the Rescue! 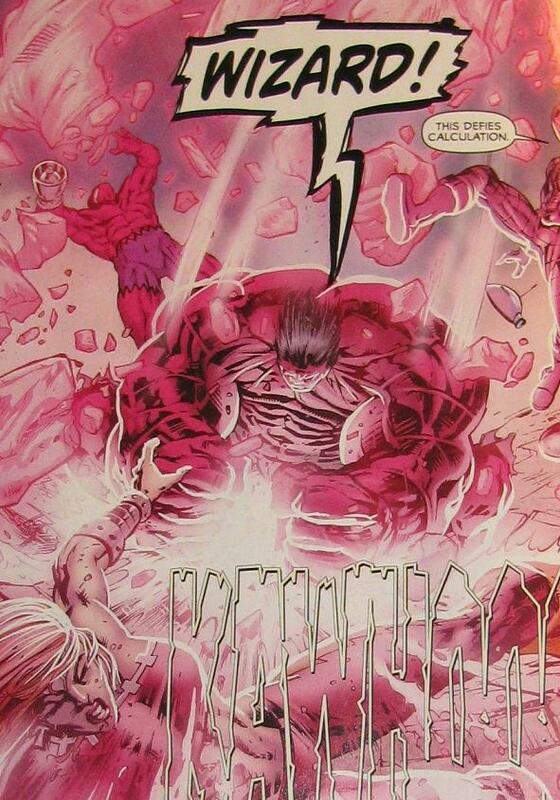 So, time comes – and Thundra sticks with the Red Hulk. When the Wizard comes a knockin’ for her to join his Frightful Four and she says no – which angers the villains – the Red Hulk comes to her rescue. 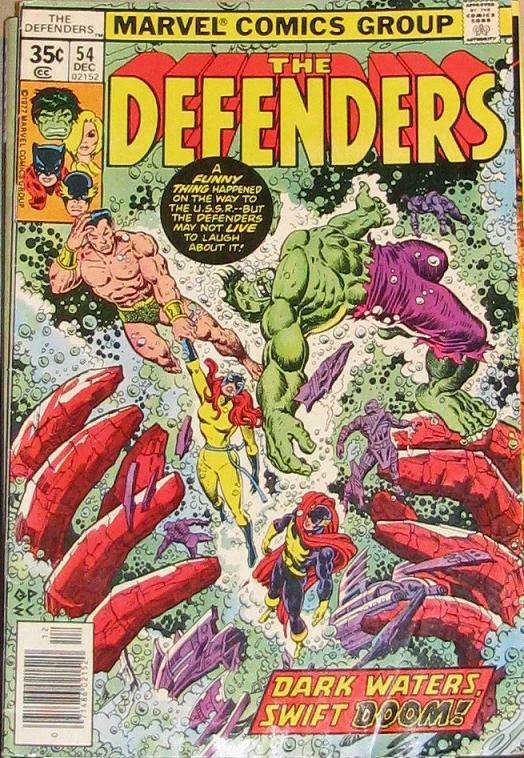 Afterward, the two head to Doom’s castle to get his time machine – since he’s now been captured and isn’t using it – and Red Hulk and Thundra are attacked by Nosferatu – who drink the Red Hulk’s blood and get very strong – but Thundra comes to Red Hulk’s rescue this time. A Week of Huge Evil Hands! 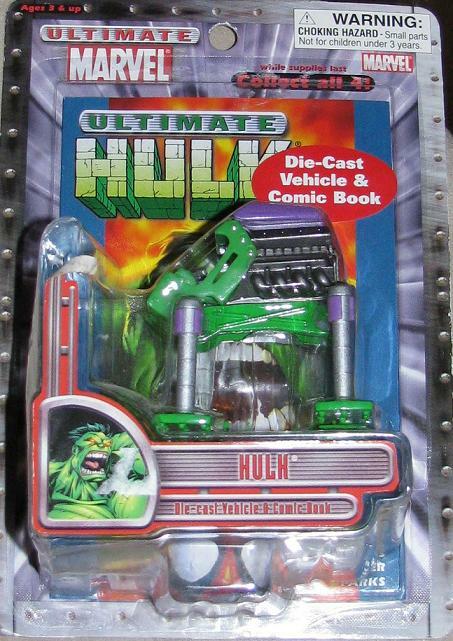 I’m telling you – EVERYTIME I hit Bedrock Comics I find new Hulk items I missed when they first came out. The top is a interesting looking 4 “legged” vehicle that doesn’t look very comfortable to ride. 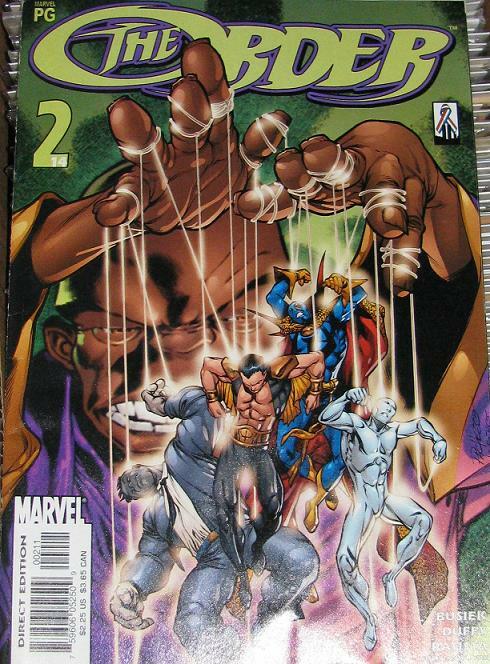 It’s part of the Ultimate Marvel Line and comes with a mini- comic – looks like the cover to Ultimate Marvel Team Up #2… which reminds me – I have to update the Comics 4 page… a ton more entries. Ugh. This is now a full on mission – it’s moved from a quest to a mission! 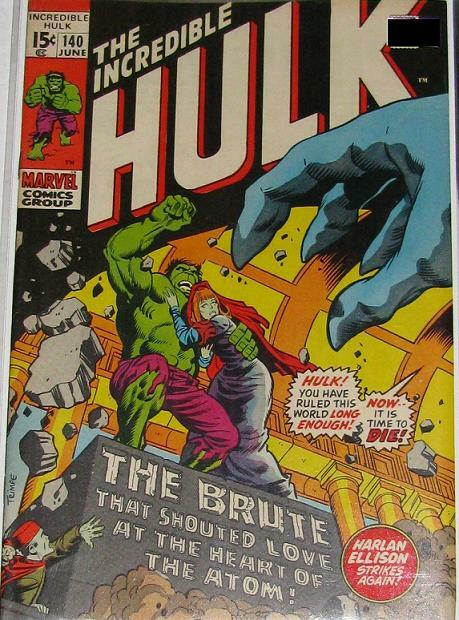 I was in a shop for a few minutes today and walked out with a dozen back issues all guest staring the Hulk. Anyways, look! 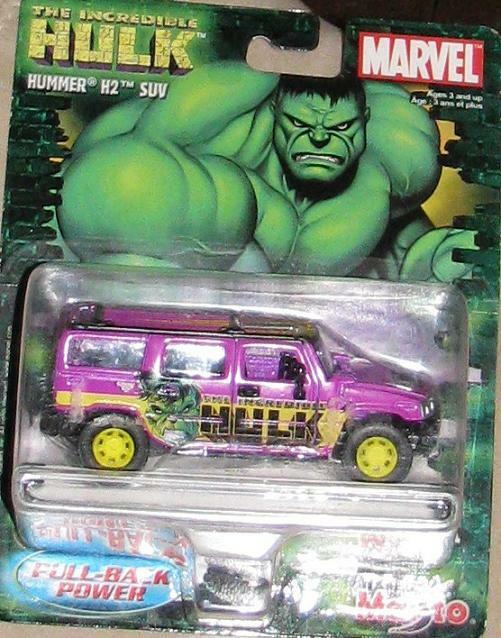 A Hulk Hummer!